Buddha Teas has a large selection of traditional and herbal teas focusing on wellness for body and mind. They sell teas that contain organic and/or wild grown ingredients. The name “Buddha Teas” was chosen not to reflect a religion, but a philosophy. One of the key aspects of Buddhism is living a life in harmony with the world, one of simplicity, generosity and filled with compassion for all life. As a company devoted to offering natural teas that are healthy for consumers and for the environment, this philosophy was a perfect fit. By taking from the earth no more than what we need, and giving back to it through recycling and compostable products, Buddha Teas would strive not to profit from the earth, but to honor it and its many blessings. 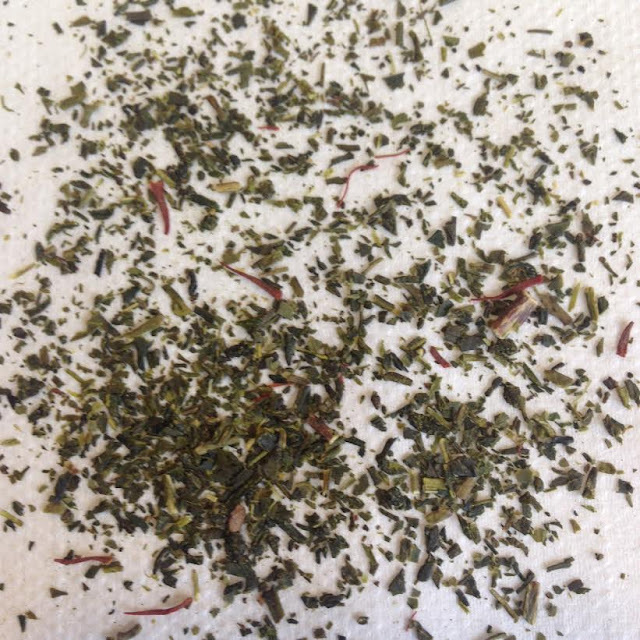 The company recently sent me their saffron and green tea blend. I've never had saffron in tea before, and I was intrigued. Saffron is an expensive ingredient and I was curious to see how much was actually added to the tea. The tea is bagged, so I opened one and had a look at the leaves. You can see quite a few bright orange saffron strands within the bits of green tea. The dry leaves have a sweet and vegetal aroma. The steeped tea is earthy, a little bit sweet, and a little savory. There is a steamed green vegetable flavor from the green tea. Overall it reminds me of steamed rice. This could be because I often have saffron in rice dishes. My favorite part of drinking this tea is the cheerful bright yellow liquid it produces. It's sunny and brings an immediate smile to my face. The saffron and green tea work nicely together creating a calming experience. The flavors don't compete or mask one another. This creates a unique flavor. Not something I'd drink every day, but a nice change of pace. The color alone would be a helpful remedy for grey winter months. The savory flavor would also work well in recipes, and I might give it a try with a rice dish or two. Each tea tag has an inspirational quote. This could feel cliche, but it actually adds to the meditative experience. The last cup I had said 'Positive mind positive vibes positive life'. A nice little reminder for cranky work days and chore filled weekends. I'm not usually a big fan of herbal teas and do not promote any wellness information. But I admit I am curious to try some of the relaxation teas that Buddha Teas offers, to see if they are at all helpful. These days I can use all the help I can get! Thank you to Buddha Teas for the box of tea! This makes me wonder if Yogi Tea (https://www.yogiproducts.com/teas/category/all-yogi-teas/) are different than Buddha Tea? Yogi Tea is so unmistakable. I mean it is very recognizable in taste...licorice like. Nice of you to have such a pleasant and rich experience. Thanks for sharing. I really like Buddha Teas for when I want something herbal too. I love their Chakra collection. I agree with you - the quotes definitely at to the meditative experience. It's a nice touch! World is well versed with Green Tea Health Benefits as it is a good combination of healthy ingredients and exquisite flavors. So say get my tea because of its unique taste and texture.